Russian billionaire Alisher Usmanov spent $100 million on Apple’s shares last week. Although the price of Apple’s shares has gone down by 40% since September 2012, Usmanov seems sure of the soundness of the investment. In an interview to Bloomberg he explained: “I believe in the future of this company even after Steve Jobs. When the company lost $100 billion of its market value, it was a good time to buy its shares, as the capitalization should rebound.” He didn’t specify when he bought his shares. "But for the next three years I believe Apple is a very promising investment, especially given large dividend payments and buybacks," Usmanov added. 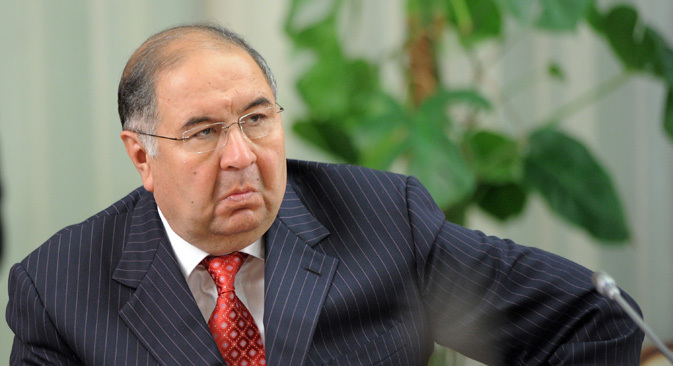 Alisher Usmanov is the biggest investor of the DST Global investment group and one of the wealthiest Russian businessmen. Last year he was named the richest Russian internet entrepreneur by Russian magazine Kommersant. Sekret Firmy. So far he has invested in Facebook, Russian Internet giant Mail.Ru Group, Alibaba.com, 360buy.com and Twitter. An important achievement was reached last week by Russian e-payment operator Qiwi, which raised $212 billion in NASDAQ-IPO. Qiwi’s shareholders sold 12.5 billion class B shares, each at $17. Russian magazine cnews.ru calculated the operation’s top-earners. Russian group Mail.Ru gained first place by selling 3.05 million shares for $51 million. Chairman and former president of Qiwi Andrei Romanenko and his father followed with 2.8 million shares in exchange for $47million. Andrei Muraviev, head of the investment firm Parus Capital and founder of the "Siberian cement" and the construction company RTM, ranked third, with 1.9 million shares sold for $32.3 million. While Russian business giants look for Western financial opportunities, their colleagues from abroad explore the Russian market’s potential. After Ebay and Amazon, ASOS wants to reach out to its Russian customers. Earlier in May the online retailer presented the Russian version of its website. To celebrate the launch the visitors of the website were treated to a series of special offers. Among others, Russian customers were able to enjoy express free delivery for all purchases over 5,000 rubles ($170). As reported by Russian newspaper Vedomosti, ASOS sees the Russian market as one of the key targets for the company. Vladimir Dolgopolov, ASOS’s sales manager for Russia, pointed out how the average bill of a Russian customer is one of the biggest out of all the markets in which the retailer operates. So far the effort seems to be paying off - Dolgopolov confirmed that after the launch of the Russian site the quantity of orders from Russia increased.